Initiated by Hans-Werner von Massow, in memory of his wife Bertl, who was a great supporter and worker for ICCF, these awards were adopted at the ICCF Congress in Poznan, Poland, in 1983. He rightly said that “through these medals, my dear wife will be present at meetings of ICCF year by year, for all the future”. They are awarded respectively for 15 years (gold) and 10 years (silver) of faithful service to ICCF, as the Delegate of a National Federation, as a Member of the ICCF Presidium, Commissions or the Zonal organisations, or as Tournament Secretary (Director) or a Team Captain of a highly placed team in the CC Olympiad or Continental (Zonal) team tournament. In Gold and Silver: F. Atabek (TRK), K.H. Boese (BRD), J.F. Cleeve (CAN), P. Clément (BEL), P. Diaconescu (ROM), J. Eventov (USA), A. Giraudet (FRA), A. Heintze (DDR), A. Henriksen (DEN), A. Kiprov (BLG), A. Iqbal (PAK), E. Larsson (SVE), J. Leguen (MRT), R. Lindroos (FIN), A. Loeffler (ARG), B. Lukas (CSR), M. Madler (BRD), H-W. von Massow (BRD), P. Mastichiadis (GRE), H.J. Mostert (NLD), W. Muir (USA), G. Negyesi (HUN), J.L. Ormond (SWZ), H. Rittner (DDR), I. Romanov (URS), W. Rosinov (URS), D. Smit (NLD), E. Spitzenberger (AUT), W. Stilling (SWZ), J. Vandorffy (HUN), W. Zagorovsky (URS). In Silver: L. Abramov (URS), G. Balbe (FRA), E.Denner (USA), F. Brglez (YUG), R. Charpentier (HUN), J. Cornu (SWZ), J. Daneyko (POL), C.G. Dieta (ARG), C.G. Fiandor (ESP), H. Furrer (SWZ), R. Gillman (ENG), R. Heemsoth (BRD), V. Houdek (CSR), R. Incelli (ITA), St. Jansson (SVE), S. Kania (POL), M. Kevicky (CSR), J.M. Ledesma Alvarez (CHI), A. Lejarza (MEX), E. Nuutilainen (FIN), M. Pakhdauman (IRN), G. Porreca (ITA), H. Rabold (DDR), J.J. Ravero (URU), H.M. Souza (PER), U. de Oliviera Barroso (URU), M.Z. Villegas (DDR), G. Weinitschke (DDR), R. Wikman (FIN), E. Winkler (DDR). In Silver: G-M. Tani (I) and H. Otte (DDR). 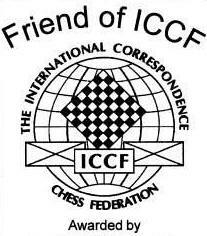 Substantial supporter and promoter of ICCF, via Internet correspondence chess site. Publishes ICCF news, information, results and games, in accordance with ICCF policy and in close co-operation with the ICCF Webmaster and senior officials. Recommendations for awards would be made by the Presidium for approval by Congress, as would recommendations for termination of awards for sites considered to be no longer actively supportive of ICCF.